For everyone who has been admitted to either campus or both, CONGRATULATIONS!! There are a number of students each year (called Dual Admits) admitted to both Emory College of Arts and Sciences and Oxford College of Emory University. If this is you, you’re in a unique position to choose where to start your first two years of your undergraduate experience. 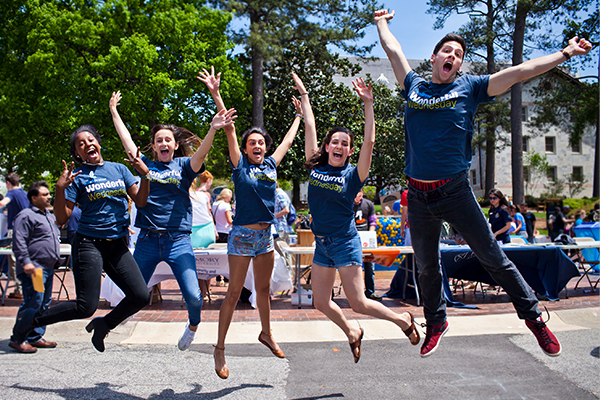 Click the links for general info about Emory and Oxford and how the two campuses work within Emory University. We’ve also compiled some of the most frequently asked questions about the two campuses to aid you in making your decision. 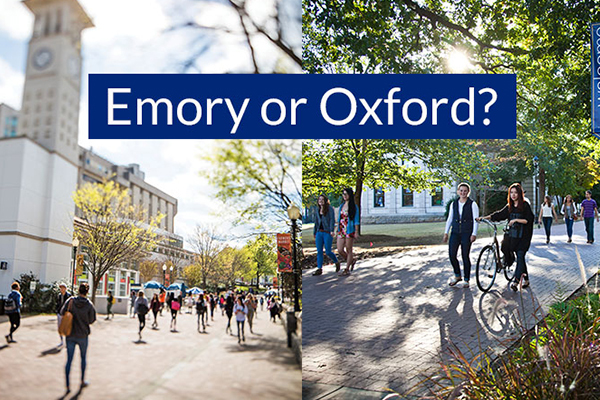 What are the primary differences between Emory College and Oxford College? We’ll break it down into a few categories where students notice the biggest differences. 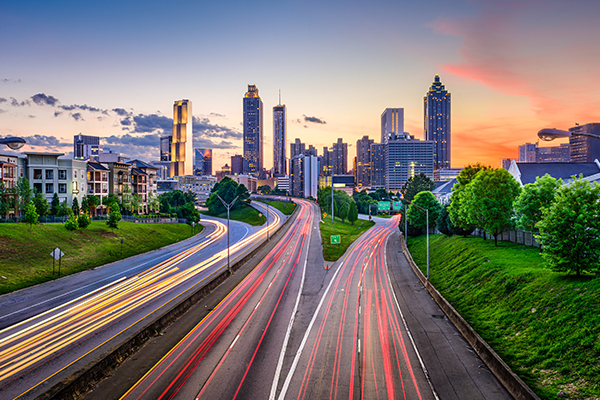 Emory College is in Atlanta—a progressive, busy city. We’re minutes from downtown, shopping, music venues, sports venues, and top-rated restaurants. Oxford College is in Oxford—this is 38 miles (45 minutes drive) east of Atlanta. It’s a quaint town with a town square and shopping nearby. It’s a rural setting. 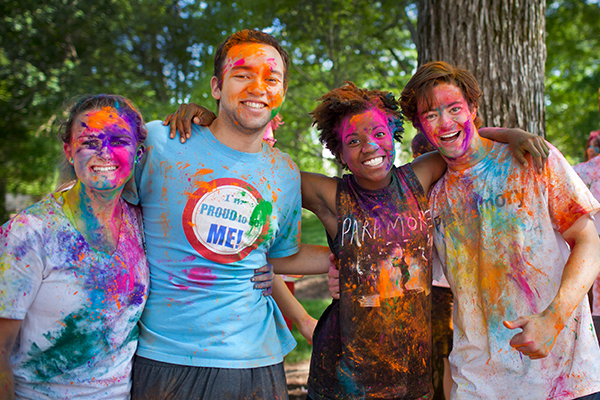 Emory College has four undergraduate classes on campus (first-years through seniors—about 6,000 students) all vying for the same leadership opportunities both inside and outside of class. Oxford College has two undergraduate classes (first-years and sophomores). This allows for tons of leadership opportunities for students right away. By your sophomore year, there are huge opportunities to be leading something, and there is definitely a club, sport, or group waiting for you! Every Oxford student will tell you this is one of the things they love most about the campus. While both campuses have strong, vibrant communities, Oxford’s is noticeably smaller and many students feel it is more close-knit because of this. Everyone knows everyone at Oxford, and they are the OxFam (as they call themselves). With just under 1000 students across the whole campus, it’s no wonder! 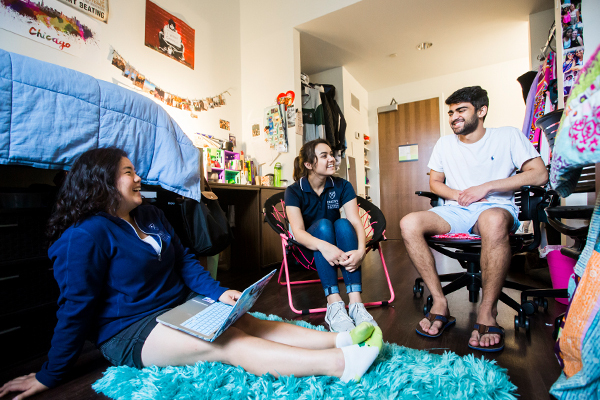 Many students make fast, close friends from day one and stay connected throughout their time at Emory University. What type of student is best suited for Oxford? This is exactly what we want you to be thinking about—am I a good fit for the Oxford community or the Emory community? Students who do best at Oxford are typically those who want early leadership opportunities. Students who want a smaller community for the important transition from high school to college. Or who value more relational support from faculty relationships—whether for academic success or simply for the sake of learning and growing as a person. If any of those sound like you, then you will likely be very happy your first two years at Oxford. How accessible is Atlanta for students at Oxford College? at Emory College? Oxford College is still accessible to Atlanta, but obviously it’s about a 45 minute drive/ride from campus. Bonus is that first-year students can have cars at Oxford, so you can get in/out of the city whenever you want if you have a car (or a friend who has a car!). Additionally, there is a daily shuttle that runs between Emory and Oxford. (Read more about the Oxford shuttle.) On the weekends, many Oxford students choose to stay on campus because they enjoy the laid-back atmosphere (or they’re studying!). However, if you want to get into Atlanta, it is possible to do so. How are classes on the two campuses different? One of the biggest differences student note between the two campuses is related to this question. First, class size. Oxford’s largest class is literally capped at 60 students because there is only one classroom on campus large enough to hold that many people. Classroom physical space maxes out at 33 students for the rest of classrooms on campus, but most classes have around 20 students. Emory College, by comparison, has classes that range from 12 students up to 130 students. Some intro classes in the sciences (like Biology and Chemistry) will have 120 students in them and then lab sections that are 15-20 students. Social science intro classes are rarely as large as 130 students and tend to hover around 60 students. In general though, the majority of classes at Emory College are 20-30 students, apart from those few large intro-science lectures. 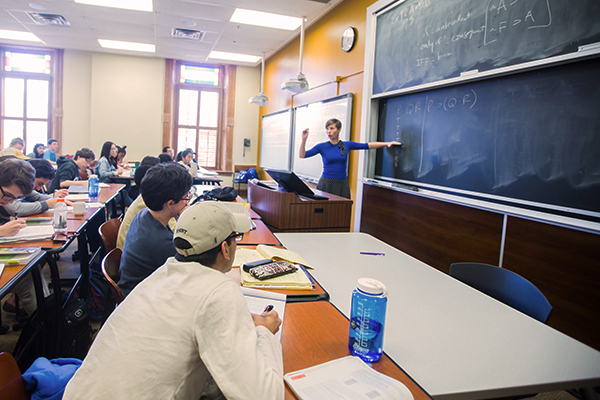 As you can imagine, class size also influences your ability to get to know your professor. Oxford students will tell you story after story of how they’ve had dinner at a professor’s house, been invited to play a tennis match, or simply hang out after class to talk further about an area of interest. Faculty-student relationships are by nature much closer at Oxford simply due to campus size. That’s not to say that Emory College students can’t also have close relationships with faculty, but these students will have to be a bit more proactive to make it happen. Which campus offers a larger course selection? Because of the campus sizes, Emory College has a larger course selection. That being said, students can pursue any major starting at the Oxford campus, including those interested in Nursing and Business. Plus, at Oxford, you aren’t competing with upperclassmen for some of the higher level courses. So when they are available, there is almost always space to sign up for the class. What are the differences in the residence halls on the two campuses? This is an easy one! The residence halls on each campus are almost identical in terms of size and amenities. Both campuses have some older residence halls. And both have some newer buildings as well. Both campuses have onsite free laundry, gyms for working out, and study spaces. Check out Emory’s Housing page and Oxford’s Housing page for more details. Are there transition issues when Oxford students move to the Atlanta campus? There are many resources in place to help with the transition; there’s an orientation day specifically for Oxford Continuees during their sophomore year. (A Continuee is our unique term for students who’ve started at Oxford and “continue” to the Atlanta campus in their junior year. Pronounced “continue-ee”). First-years at Oxford become very close with upperclassmen, and once the upperclassmen continue to the Atlanta campus, they become valuable resources and mentors for incoming Continuees. However, in many ways, the ease of the transition also depends on the student. Students who are proactive in getting involved on the Atlanta campus will have an easier time integrating into the community. What are some of the aspects of Oxford that students miss once they start at the Atlanta campus? Most people miss the close-knit vibe of Oxford’s community. For example, just a regular meal at the Oxford dining hall, you can walk in at any time without making plans and know you’ll see friends to sit with. But luckily, Oxford Continuees are transitioning alongside 225 of their closest friends, so Emory quickly becomes their new home. Do Oxford students feel left out or isolated from the Atlanta campus? While it’s definitely an adjustment between Oxford and the Atlanta campus, the Atlanta campus is also inclusive and friendly. Most students on the Atlanta campus are simply curious to learn more about Oxford’s campus and how Oxford students’ experiences have differed from theirs. In any case, Oxford Continuees often end up being over-represented in academic and extracurricular leadership on the Atlanta campus, because that’s what they’ve grown accustomed to doing at Oxford. Many Continuees naturally integrate well into the overall Atlanta campus community. Why do students pick Oxford over Emory? Hopefully after reading through this post, you can see that there are many great reasons students would choose Oxford. 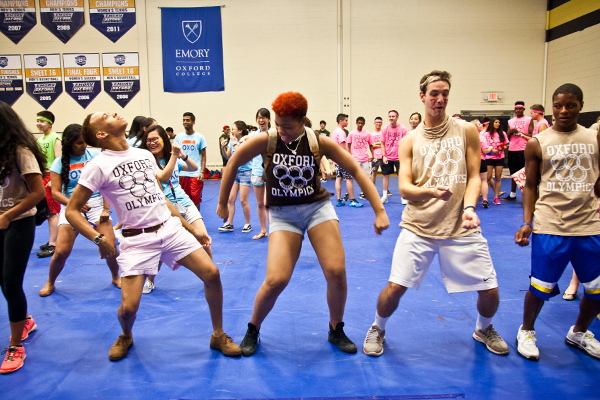 Most students who choose Oxford do so because they want to experience both Oxford and Emory. Many students want a smaller, more close-knit environment to make the transition from high school to college. Many students enjoy the slower pace of life of Oxford (vs. Atlanta). Plus, the class sizes are generally smaller and that means you can have closer relationships with faculty, getting more one-on-one attention and feedback academically. There are a lot of great reasons to choose Oxford, and it ultimately comes down to what kind of college experience you want for your first two years.